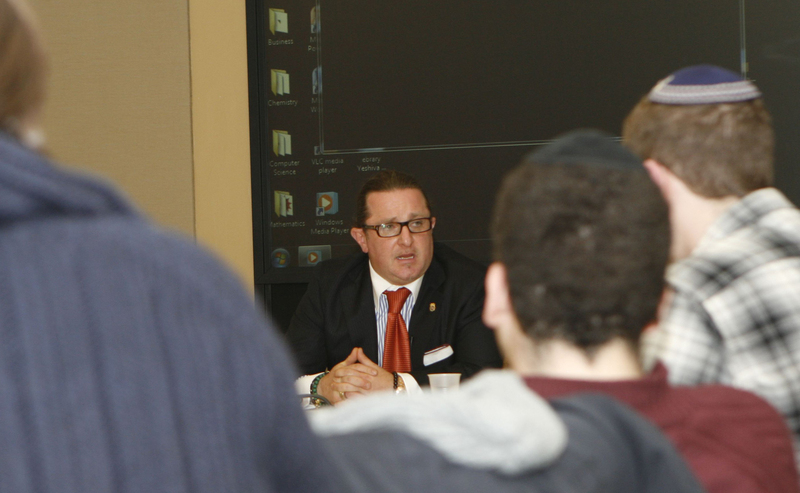 On January 25, students at Yeshiva University’s Syms School of Business gathered around a conference table in Belfer Hall for a discussion with Evgeny Freidman, the business mogul who has made hundreds of millions in the taxi industry. Evgeny Freidman oversees New York's largest taxi fleet. The event, called “Crazy Taxi,” was the first in the Syms Student Council Spotlight Series. The series seeks to introduce students to entrepreneurs from an array of surprising fields and backgrounds. In Freidman’s case, that included immigrating to New York from the Former Soviet Union at the age of five and a rough-and-tumble adolescence that got him kicked out of Skidmore College and working at a local video store in Queens, NY. “I looked at myself and said, ‘Never again,’ ” said Freidman. After packing six semesters’ worth of coursework into three, Freidman received his bachelor’s in accounting/business from Skidmore and was accepted to YU’s Benjamin N. Cardozo School of Law, where he graduated at age 23. As students listened keenly and asked questions, Freidman detailed the beginnings of his business career in venture capital projects in Russia for billionaire Sam Zell and an argument with his father that changed everything. 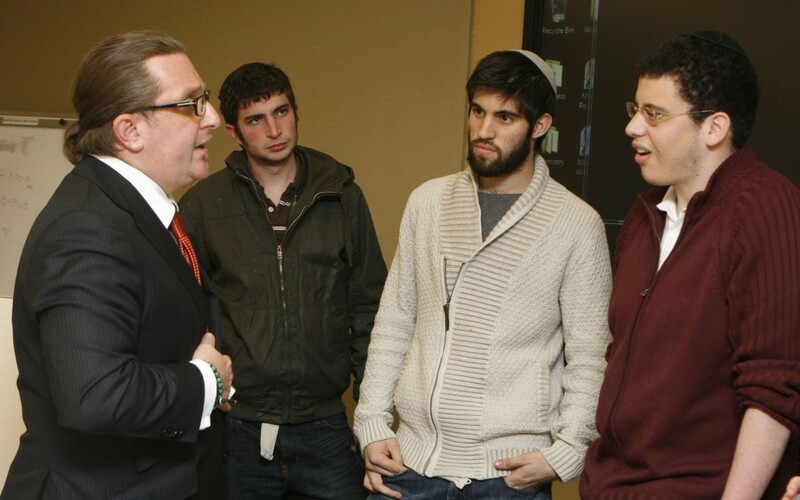 Freidman, a Cardozo alumnus, took questions from students at the Jan. 25 event. 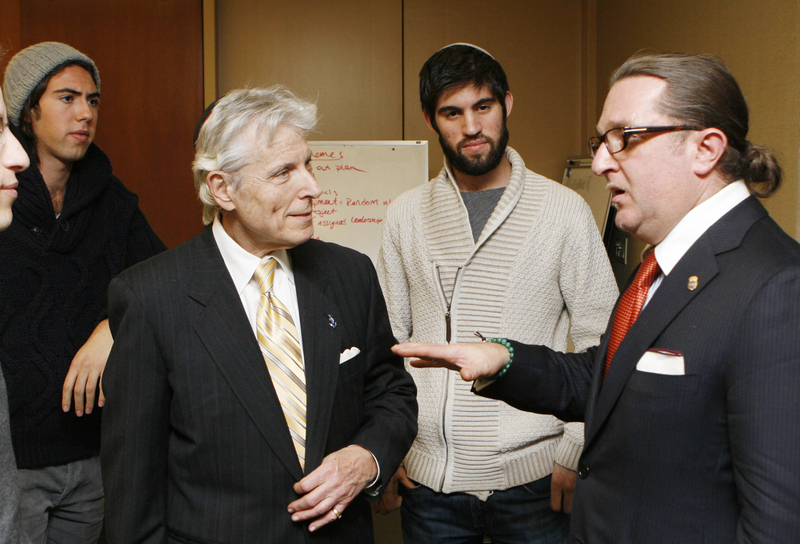 Freidman walked students through the inspired and strategic business decisions which have made him the manager of the largest taxi fleet in New York and revolutionized the taxi industry as a whole. He stressed innovative thinking and discussed basic challenges, such as securing financing, as well as the impact of unique and potentially debilitating crises like the 2008 blackout. “I had 850 taxis and not one of them could fill up their tank,” Freidman said. He’s ready for the next time, though: after the blackout, he bought gas stations and now has a reserve of gas to keep his fleet running no matter what happens. Today, as principal of Taxi Club Management, Inc., Freidman is worth more than $600 million and has been featured in Crain’s New York “40 Under 40” series. The evening’s intimate, conversational atmosphere gave students the opportunity to ask Freidman about everything from his logic in bringing hybrid taxis to the industry to insight into the taxi driver workforce. They also debated the pros and cons of expanding Freidman’s business across the country and overseas. Michael Strauss, associate director of student advising and administration and clinical professor of management at Syms, pointed to Freidman’s high-risk, high-reward philosophy as a thought-provoking aspect of the night’s discussion. “I think this is a tremendous opportunity for our students to get hands-on insight into how someone who is entrepreneurially-motivated can start a business and become a multimillionaire at the young age of 42,” he said. Syms Student Council President Benjamin Blumenthal initially thought to ask Freidman to speak after a taxi driver began telling him and a friend about the steep value of medallions. “We got out, looked at each other and said, ‘We have to learn more about this,” said Blumenthal. Their research led them to Freidman’s story. I simply want to say I am new to weblog and definitely loved your web page. Probably I’m planning to bookmark your blog post . You really have beneficial writings. Appreciate it for sharing your web-site. I simply want to say I’m all new to blogging and really liked this web-site. Almost certainly I’m planning to bookmark your blog . You really come with terrific posts. Regards for sharing with us your website. I simply want to tell you that I am newbie to blogs and seriously savored you’re blog site. Very likely I’m want to bookmark your site . You certainly have fabulous writings. Cheers for sharing with us your website page. I simply want to tell you that I am just beginner to blogs and actually enjoyed this web site. Probably I’m going to bookmark your site . You amazingly have outstanding articles. Thanks for sharing your web-site. I simply want to say I am just very new to blogging and definitely enjoyed this web blog. More than likely I’m planning to bookmark your blog post . You actually come with excellent articles. Thanks a bunch for sharing your blog site. I just want to tell you that I am just very new to weblog and seriously enjoyed your blog. Likely I’m going to bookmark your blog . You definitely have beneficial articles and reviews. Cheers for sharing your web-site. I just want to say I am all new to blogs and certainly savored you’re web-site. Very likely I’m planning to bookmark your site . You really have tremendous stories. Thanks a lot for revealing your web-site. I simply want to tell you that I’m very new to weblog and certainly liked this blog. More than likely I’m going to bookmark your website . You definitely come with very good stories. With thanks for sharing your web site. I simply want to mention I am beginner to blogging and site-building and certainly savored this web blog. More than likely I’m going to bookmark your blog . You surely come with fabulous article content. Thanks a bunch for sharing your blog. I simply want to tell you that I am just all new to weblog and really enjoyed you’re web site. Probably I’m planning to bookmark your site . You absolutely have remarkable stories. Thanks a lot for sharing with us your blog. I simply want to tell you that I am just newbie to weblog and definitely liked your blog. Almost certainly I’m going to bookmark your blog . You absolutely have amazing well written articles. Kudos for revealing your website. I just want to mention I am just new to blogs and honestly savored your web-site. More than likely I’m likely to bookmark your blog . You actually come with good well written articles. Thanks for sharing your blog. I simply want to mention I am all new to blogging and site-building and actually savored you’re web blog. More than likely I’m likely to bookmark your website . You surely come with good article content. Bless you for sharing your website page. I just want to tell you that I’m all new to blogging and site-building and certainly loved your page. Probably I’m going to bookmark your blog post . You amazingly come with beneficial well written articles. Thanks for revealing your web page. I simply want to say I am just newbie to weblog and absolutely loved you’re web site. Most likely I’m planning to bookmark your blog post . You certainly come with outstanding articles. Kudos for sharing your web page. I just want to say I’m all new to blogging and honestly enjoyed you’re web site. Probably I’m going to bookmark your site . You surely come with impressive well written articles. Kudos for sharing your web page. I just want to say I’m newbie to blogging and site-building and truly savored this website. Very likely I’m planning to bookmark your blog post . You actually have wonderful article content. Appreciate it for sharing with us your web site. I simply want to say I’m newbie to blogging and seriously savored you’re web blog. Almost certainly I’m going to bookmark your blog . You really come with very good article content. Appreciate it for sharing your website. I just want to say I am newbie to blogging and site-building and truly savored this web blog. Most likely I’m likely to bookmark your blog post . You certainly have fantastic article content. Regards for sharing with us your webpage.